It is in Aragon, a region of Spain close to the Pyrenees. Zaragoza it’s its capital and Belchite is about 40 km Southeast of Zaragoza. In 1937, during the Spanish Civil War, the Nationalist army was in this 3.000 inhabitants town. The Republicans were advancing, trying to reach Zaragoza. And, after being the location of a battle during the Napoleonic Peninsular War, Belchite was once again the scenario for a carnage. Only this time it was completely destroyed in the process. “After failed attempts to capture Brunete, the Republican military leadership decided to try a new series of offensives to slow down the Nationalist advance in the north. A new campaign, therefore, was planned for Aragon. The decision was based on political as well as military considerations, as the government saw it as a way to decrease anarchist and Workers’ Party of Marxist Unification (POUM) influence in the region by bringing in communist troops and incorporating three anarchist divisions into the newly-designated Army of the East under command of general Sebastián Pozas. Another objective of the planned offensive was to take Zaragoza, the capital of Aragon, which was only a few kilometres behind enemy lines. Capturing the regional capital offered more than symbolic significance, because it was also the communication centre of whole Aragon front. The first year of the war in this part of Spain had emphasised that the possession of key town was of far greater importance than the control of wide areas of open countryside. The Nationalists had only three divisions, the Fifty-First, Fifty-Second and One-Hundred-Fifth, spread across the three hundred kilometres of front, with the majority of their troops concentrated in towns. General Pozas and his chief-of-staff Antonio Cordon set up their headquarters in Bujaraloz. Their plan was to break through at seven different points on the central hundred-kilometre stretch between Zuera and Belchite. The object of splitting their attacking forces was to divide any Nationalist counter-attack and to offer fewer targets for bombing and strafing than at Brunete. The Republican Army of the East, together with the XI and XV International Brigades, started its offensive with eighty thousand men, three squadrons of aviation with Polikarpov I-16 (moscas), Polikarpov I-15 (chatos) (ninety airplanes in total) and one hundred five T-26 tanks in three main and five secondary directions on a hundred-kilometre stretch between Zuera and Belchite. On the first two fronts (north and centre), the Republicans managed to take only vacant territories. On the southern portion of the front, the Republican army took the village of Mediana immediately and Quinto was taken on the fourth day of the offensive. In the village of Codo, there were three Requeté companies that tied down two Republican brigades. 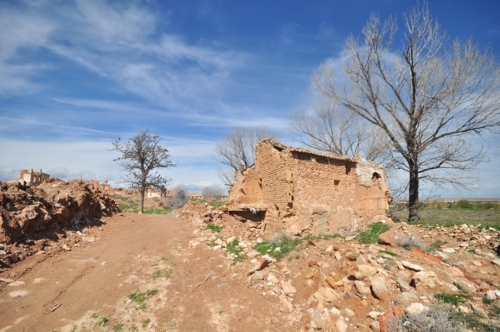 The fiercest resistance was encountered in Belchite, where seven thousand Nationalist defenders resisted until 7 September in the surrounded town when Republicans took it. These delays allowed the Nationalists to bring reinforcements and the full-scale offensive on Zaragoza failed. With five nationalist divisions whereof two were withdrawn from Madrid front, artillery and 65 Fiat CR.32, Heinkel He 46, Savoia Sm-49 and Messerschmitt Bf-109 nationalist counter offensive started on 30 August and ended on 6 September. The only major Nationalist success was the shooting down five I-15, but they were unable to break Republican lines. Although the Republicans gained some initial success and managed to push the front line ten kilometres deeper into Nationalist territory, both of the main objectives of the offensive failed. The Nationalists did not postpone their big offensive in the north, as they had done before the Battle of Brunete, and the attempt to capture Saragossa failed. So this is the story. Now, to get to Belchite you will want to take a HIFE bus from Zaragoza. There is only one at 10:30 and one back at 15:35. Ticket costs (March 2013) 4,60 Each way. Easy to find the ticket office and the platform, in Delicias main station (both to bus and trains). Recently the local parish fenced the whole perimeter of Belchite and in theory visitors are not allowed to enter if not escorted by an authorized local guide. The tour costs 6 Eur and it takes almost 2 hours. Or you can walk around and enter. In the worst scenario you will be informed that you can’t be in the area. If you visit during “siesta” time (14-16 h) it’s unlikely that you find someone from the local parish.